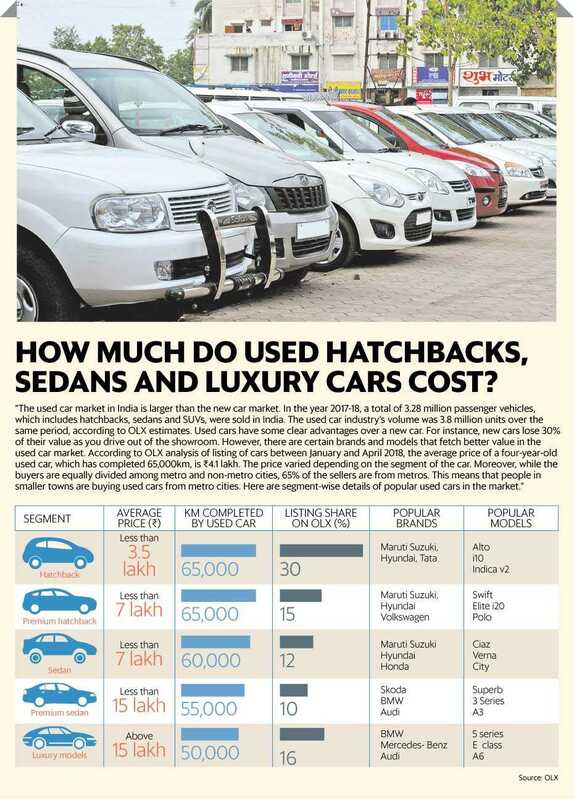 How much do used hatchbacks, sedans and luxury cars cost? The used car market in India is larger than the new car market. In the year 2017-18, a total of 3.28 million passenger vehicles, which includes hatchbacks, sedans and SUVs, were sold in India. The used car industry’s volume was 3.8 million units over the same period, according to OLX estimates. Used cars have some clear advantages over a new car. For instance, new cars lose 30% of their value as you drive out of the showroom. However, there are certain brands and models that fetch better valuein the used car market. According to OLX analysis of listing of cars between January and April 2018, the average price of a four-year-old used car, which has completed 65,000km, is Rs 4.1 lakh. The price varied depending on the segment of the car. Moreover, while the buyers are equally divided among metro and non-metro cities, 65% of the sellers are from metros. This means that people in smaller towns are buying used cars from metro cities. Here are segment-wise details of popular used cars in the market.